The fine details and arresting subject matter are what makes Vinnie's artwork so striking. In order to achieve such graphic pieces, Vinnie has to start with images that he contours into fundamental shapes to create a sketch. With this sketch, he makes precise cuts, eliminating negative space and creating highlights and shadows, all while keeping the likeness of the original image intact. This becomes the stencil he scales and ultimately colors with simple, black spray paint and a white marker. By combining this extensive process with strong imagery, Vinnie's artwork delivers a powerful presence. We went to the show on opening night and it was awesome. Derby City Spirits was on hand with some of their own Moonshine for sampling, which paired perfectly with the artwork. While we were there, we got to ask Vinnie a few questions about the show and his process. How long have you been stenciling and what made you decide to focus on that particular technique? I've been cutting stencils since high school, so about 15 years. After working though many styles of art I found that I loved the precision and detail it took to cut stencils from the things that I drew. It gave me a way to reprint images onto many different mediums and use markers to recreate the same piece in many different ways. How does the tattooing process compare to creating one of your art pieces? Tattooing feels very similar to the way i draw, but even more so when it comes to stencils. The process of taking my image and converting it to the larger stencils requires a lot of focus. I have to decide where lines belong to create the image and it requires me to work precisely until it has a finished look. Just like tattooing, focus and precision are key. Are there any particular influences to your aesthetic? My images are heavily influenced by tin type photos, steam punk images and single-color silk screening. Can you briefly describe the process of putting together your pieces for Moonshine? Well, I sketched some images from my imagination and altered some photos I found that inspired me, then used them to cut and create from. Very much, the largest of the Popcorn Sutton portraits. Lots of great musicians root themselves in the bootlegging tradition of Appalachia. What music were you listening to while you worked on Moonshine? I listened to bands such as Carrie Nation & The Speakeasy, Filthy Still and Carolina Chocolate Drops. 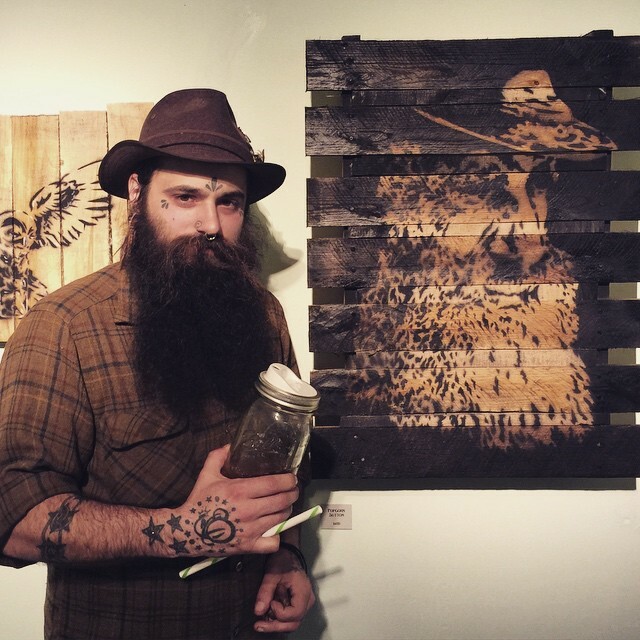 Vinnie Kochert's solo show, Moonshine, is currently on display at Revelry Boutique Gallery in Louisville, Kentucky through April 23, 2015. He is also a tattoo artist at Twisted Images Tattoo Parlor in the Highlands. You can follow him on Instagram and see his artwork throughout the year at numerous local art shows including the UnFair in October.